Hannah Graham (32) of Bowdoin College dribbles past a defender during a regular season game this winter. ROCHESTER, Minn. — The Bowdoin College women’s basketball team overwhelmed Wartburg, 90-62, in the semifinals of the NCAA Division III Championship on Friday evening. The Polar Bears (29-2) advance to the Division III Championship game for the second time in school history where they will face conference foe Amherst in the title match at 8:30 p.m. on Saturday at the Mayo Civic Center. Wartburg loses their first game of the season and ends their year at 31-1. 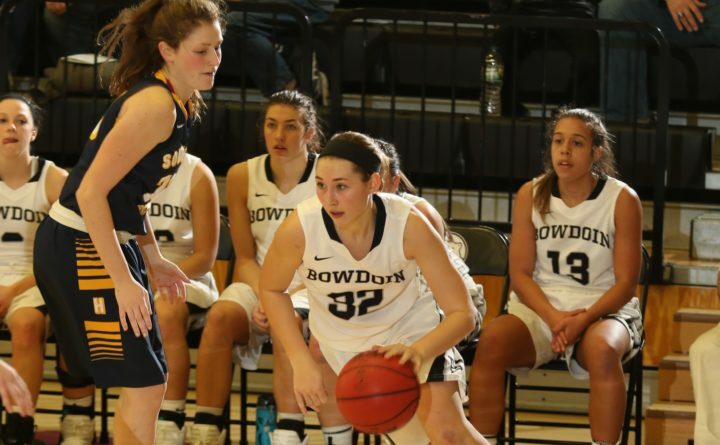 Bowdoin took control from the opening tip as Kate Kerrigan dashed in for a game-opening hoop off the tip-off, sparking a 7-3 run for the Polar Bears. Wartburg closed to within 7-6, but Bowdoin’s Cordelia Stewart put home a three-point play to regain the four-point lead at 10-6 midway through the opening frame. From there, Abby Kelly took complete command of the game, knocking down consecutive three-pointers to help Bowdoin build a commanding 28-12 lead after the first period. Bowdoin shot 12-22 (54.4 percent) in the first quarter. Kelly continued to roll in the second quarter, connecting on 3-4 from long distance and 5-6 overall from the field. The Knights were able to stay within striking distance thanks to five free throws as the Polar Bears did not attempt a single free throw in the second quarter and carried a 46-31 lead into halftime. Wartburg gave Bowdoin their best shot in the opening minutes of the third quarter, opening the period on a 7-2 surge to cut the Polar Bear lead to 10 points, 48-38, with 7:46 left in the stanza. Bowdoin proved unfazed and responded with a 12-0 run, featuring five points from Maddie Hasson, to push the lead to 22 points, 62-40, with 4:30 to go in the third. The Polar Bears increased their lead to 72-49 entering the fourth quarter. Sitting on 999 points entering the fourth quarter, senior and WBCA Division III Player of the Year Kate Kerrigan delivered the knockout blow, cashing in a three-pointer from the baseline with 7:45 to go, giving the Polar Bears an insurmountable 75-51 lead and becoming the 14th player in Bowdoin women’s basketball to surpass 1,000 career points. At Las Cruces, New Mexico, Tristen Carranza and Caleb Henderson homered to key a three-run seventh inning that rallied the Aggies to victory on Friday night. Carranza’s two-run shot off relief loser Matt Geoffrion (1-1) tied it, then Henderson’s solo blast provided the margin of victory. Carranza also posted two singles and another RBI and Henderson added a single. Mason Fishback singled twice with two RBIs. Chance Hroch (2-0) earned the win with one shutout inning in relief of Kyle Bradish, who allowed seven hits and five runs with nine strikeouts and three walks in six innings. Brock Whittlesey earned his second save with two innings of two-hit ball and four strikeouts. For UMaine, Danny Casals cranked a three-run homer in the fifth and added a run-scoring single. Colin Ridley (RBI), Jeremy Pena (double, triple) and Cody Pasic connected for two hits apiece. Geoffrion surrendered five hits and three runs in 2 2/3 innings after Zach Winn allowed four hits and three runs (3 strikeouts, 4 walks, 1 hit batsman) over the first 4 1/3. The Black Bears threatened in the eighth when Caleb Kerbs and Ridley singled, then advanced on Kevin Doody’s sacrifice bunt. However, Whittlesey fanned Pasic and induced Pena to ground out to escape the jam. Whittlesey struck out the side in the ninth.